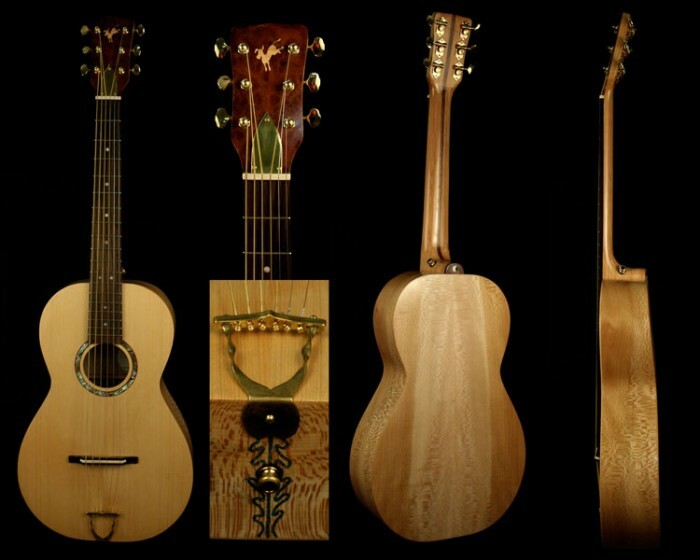 » Blog Archive » February 9 - SOLD OUT - West Michigan Luthier Concert - 7:30 p.m.
February 9 - SOLD OUT - West Michigan Luthier Concert - 7:30 p.m.
NCCA-Artsplace and Dogwood Center for the Performing Arts present the West Michigan Luthier Concert, an event that is the ultimate combination of music and visual arts. On Saturday, February 9, at 7:30 p.m., the concert will combine the beautiful artistry of local luthiers, stringed instrument makers, from throughout West Michigan with the talents of gifted musicians. This great evening will begin with Catlin Hill and Soul Vine (Jennifer Schofield, Tallulah Lancaster, and Brooke Fletcher) performing with violins made by Elon Howe. Luthier Keith Caldwell, accompanied by Jerry Roberts, Jack Schipper, and Michelle Emmorey, will be performing with Caldwell’s handmade instruments. Luthier and Dobro expert, Tim Scheerhorn will be performing for the first time in the West Michigan Luthier Concert with one of his Resonator guitars. Following Tim will be luthier Don Benson accompanied by his granddaughters, Cyanne and Cora, who are both learning the art of lutherie. Sue Anderson will begin the second half of the concert performing with one of the late Robert Sayers guitars. Luthier Jim Spalink will again be performing with his beautiful harps. The evening will wrap up with Ralston Bowles, performing with a guitar made by luthier Bryan Galloup. The live performance will also include a chance to meet the artists. A meet and greet reception will be from 6:30 to 7:15 p.m. in the lobby of the Dogwood Center. This is an opportunity to learn about the instrument building process and view the instruments. The concert will begin at 7:30 p.m., in the Dogwood Center Black Box with doors opening at 7:00 p.m. for seating. To complement the concert, an exhibit of photographs of handmade instruments made by West Michigan luthiers will be on display in the Dogwood Lobby Gallery from January 22 through February 23. The photographs include ukuleles, violins, violas, banjos and acoustic guitars. Come out and enjoy this popular concert by regional musicians performing on hand-made instruments from West Michigan luthiers. SOLD OUT. Black Box. General admission seating. 7:30 p.m. Tables can be reserved with the purchase of eight tickets.